Access from Ikebukuro West Exit and details about us. Go straight from Ikebukuro Station's Wset Exit. Turn right at West Exit Five-forked Crossing at Marui City Ikebukuro,and go straight with Mitsui Sumitomo Bank on your right.Pass by Family Mart(on your left) and Rosa Kaikan Bldg(right),then turn left at Ikebukuro Post Office Crossing at Pasela. 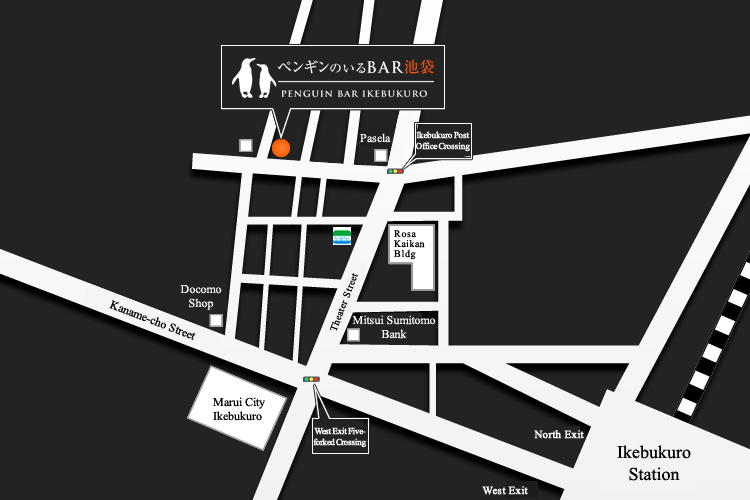 Walk for a while, and you will find Bar with Penguins at the 1st floor of a building on your right.8 minutes walk from JR Ikebukuro Station.